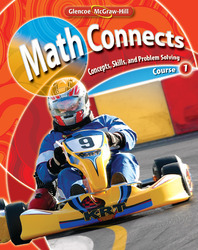 Math Connects: Concepts, Skills, and Problem Solving was written by the authorship team with the end results in mind. They looked at the content needed to be successful in Geometry and Algebra and backmapped the development of mathematical content, concepts, and procedures to PreK to ensure a solid foundation and seamless transition from grade level to grade level. The series is organized around the new NCTM Focal Points and is designed to meet most state standards. Math Connects focuses on three key areas of vocabulary to build mathematical literacy, intervention options aligned to RtI, and a comprehensive assessment system of diagnostic, formative, and summative assessments. A 6-8 math curriculum designed to provide students the content to succeed in high school math. Provides intervention options prescribed within the program or referenced to Math Triumphs, an RTI Tier 3 companion intervention program. Enhanced differentiated instruction through lesson interleaves with leveled instructional alternatives for each lesson. Focus on concepts, skills, and problem solving for a truly balanced program.